Paradise Rock is that part of a broken reef that has revealed several boulders unprotected in the currents. Paradise Rock or Nassimo Thila can be found in the centre of the channel to the south west of Lankan Finolhu, reached in one hour sailing from Male'. This is an advanced dive. The top of the reef is at 9 meters and the best point is on the eastern side of the reef facing the ocean current. Here a large section of the reef about 100 meters long has broken away, depositing a series of large boulders at about 45 meters deep. Where the corals have fallen away, a long series of caverns and overhangs remain. The whole area is constantly washed with ocean currents and the overhangs are packed with colorful soft corals and sponges. 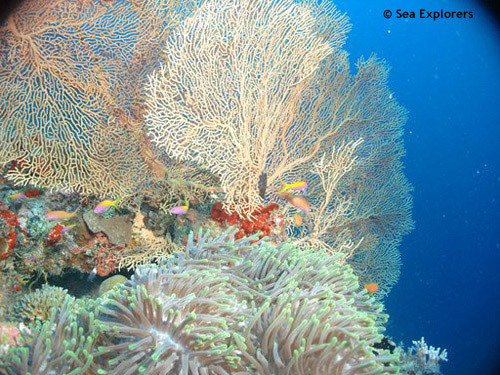 The rocks are overgrown with sea fans, black coral and are full of fish life. Schools of snappers, fusiliers and sweet lips are common. Maldives Dive Travel guarantees unforgettable Maldives holidays at lowest prices! Book your Maldives holiday directly online and choose from our diverse selection of scuba diving liveaboard safari ships. We offer a wide range of scuba diving holidays on liveaboards to suit every taste and budget. With over 20 years of experience in scuba diving in the Maldives and unrivalled expertise, our team is happy to assist you with booking your own cruise on the dive ship of your choice. Explore the atolls and enjoy your Maldives vacation with our selection of great value holidays. All liveaboards are checked regularly to ensure the highest level of service and safety. Maldives Dive Travel guarantees unforgettable Maldives holidays at lowest prices!